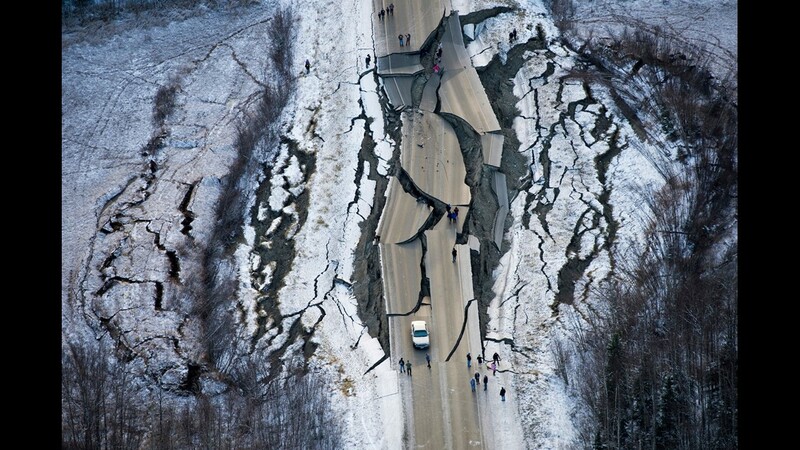 This aerial photo shows damage on Vine Road, south of Wasilla, Alaska, after earthquakes Friday, Nov. 30, 2018. Back-to-back earthquakes measuring 7.0 and 5.7 shattered highways and rocked buildings Friday in Anchorage and the surrounding area, sending people running into the streets and briefly triggering a tsunami warning for islands and coastal areas south of the city. 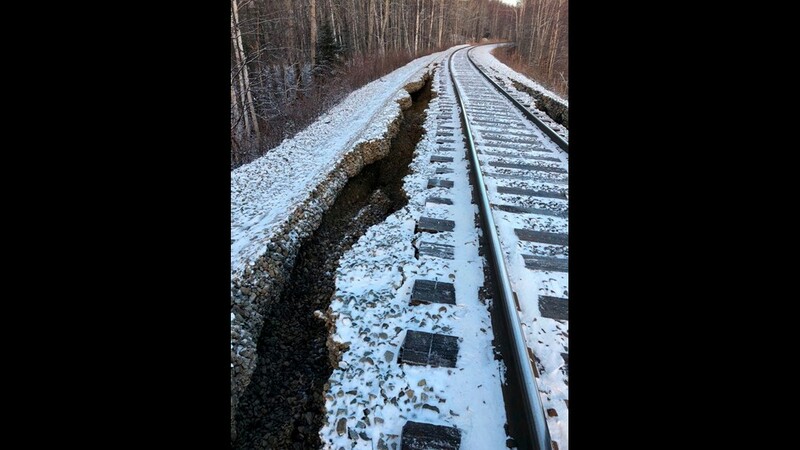 This Friday, Nov. 30, 2018 photo provided by Alaska Railroad Corp. shows damage from a magnitude 7.0 earthquake by Nancy Lake, near Willow, Alaska. 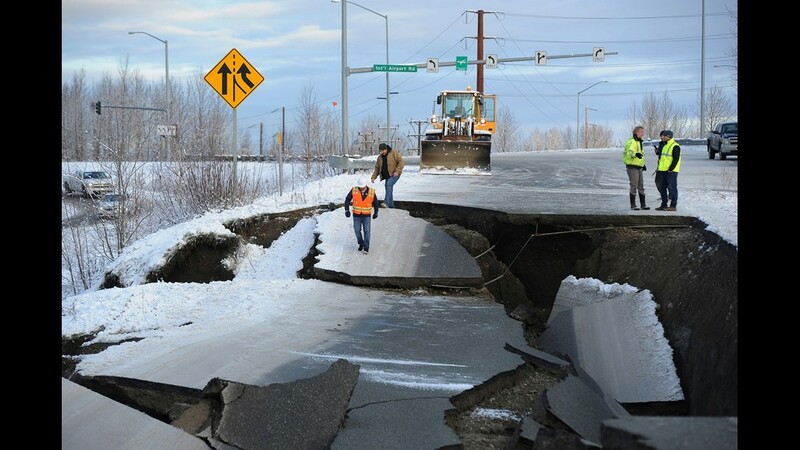 The railroad will use heavy equipment to repair the damage before it can resume train traffic between Anchorage and Fairbanks, Alaska's two largest cities. 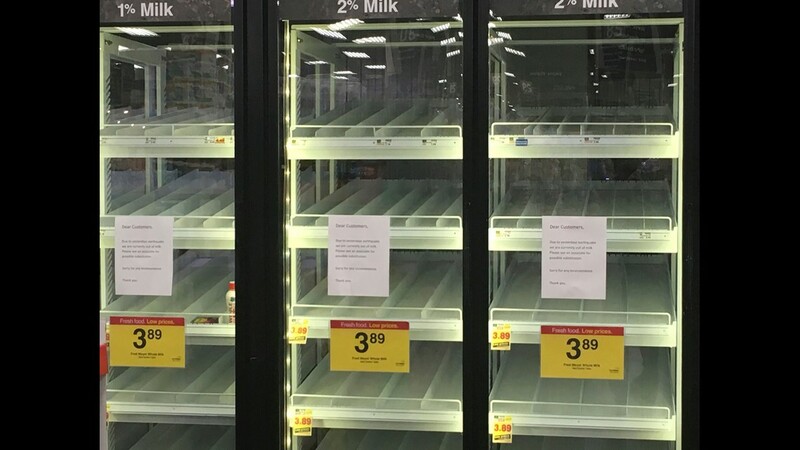 Empty milk refrigerators are shown at a grocery store in Anchorage, Alaska, on Sunday, Dec. 2, 2018, two days after a magnitude 7.0 earthquake was centered north of the city. Anchorage officials urged residents not to stock up and hoard supplies because the supply chain of goods was not interrupted. 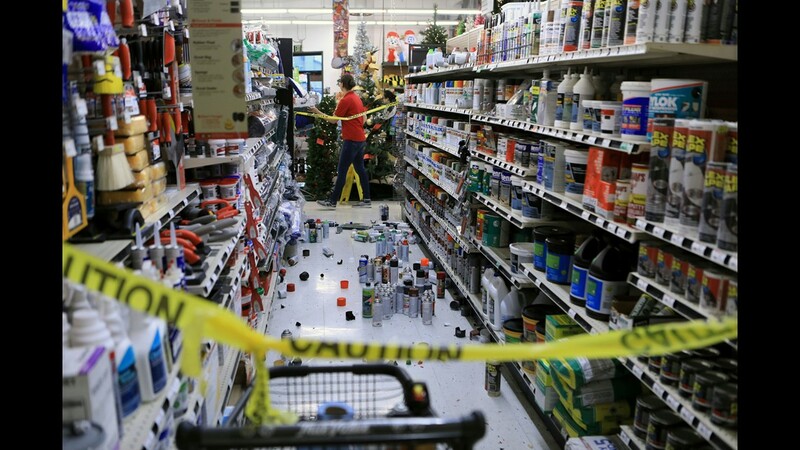 An employee walks past a damaged aisle at Anchorage True Value hardware store after an earthquake, Friday morning, Nov. 30, 2018, in Anchorage, Alaska. 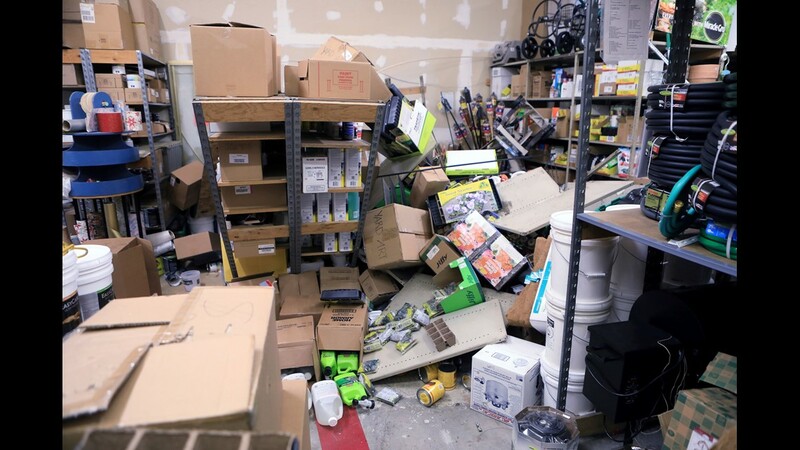 Tim Craig, owner of the south Anchorage store, said no one was injured but hundreds of items hit the floor and two shelves collapsed in a stock room. 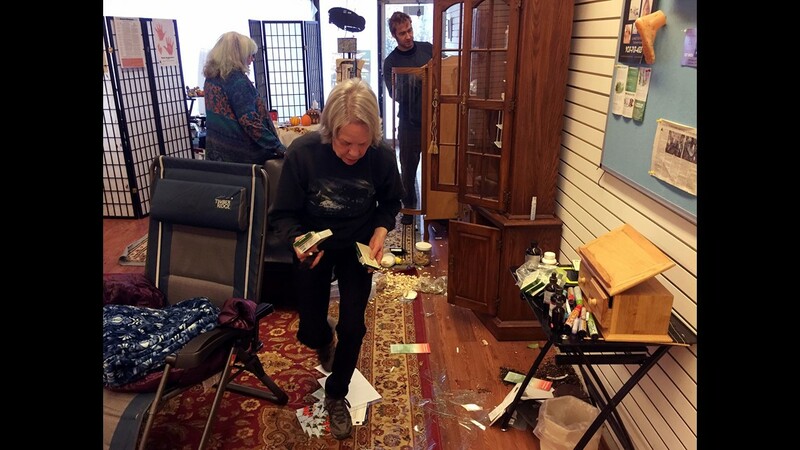 Staff begin the clean up process after an earthquake caused damage at the Alaska Institute of Oriental Medicine in Anchorage, Alaska on Friday, Nov. 30, 2018. 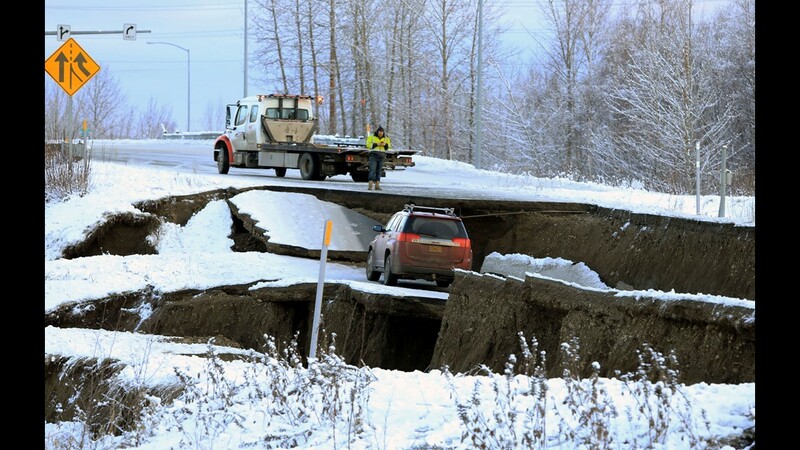 Workers inspect an off-ramp that collapsed during a morning earthquake, Friday, Nov. 30, 2018, in Anchorage, Alaska. 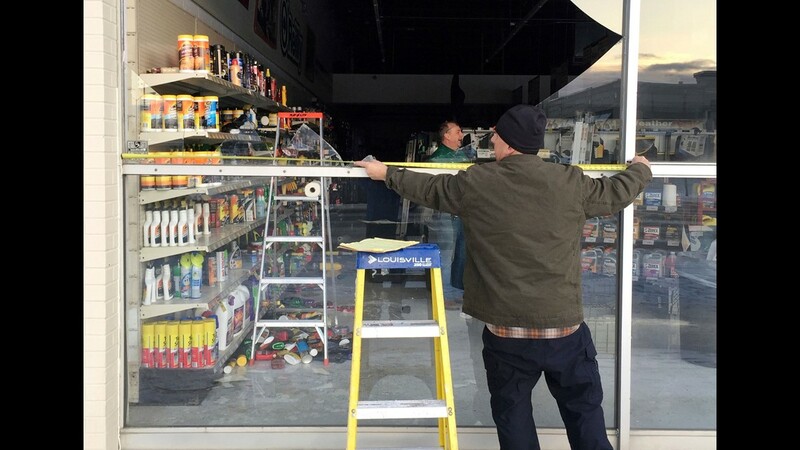 Dennis Keeling measures for a broken window at an auto parts store in Anchorage, on Friday, Nov. 30, 2018. Back-to-back earthquakes measuring 7.0 and 5.8 rocked buildings and buckled roads Friday morning in Anchorage, prompting people to run from their offices or seek shelter under office desks, while a tsunami warning had some seeking higher ground. A tow truck driver assesses a car stuck on a section of an off-ramp that collapsed during an earthquake Friday morning, Nov. 30, 2018 in Anchorage, Alaska. The driver was not injured attempting to exit Minnesota Drive at International Airport Road. Items from two shelves that came unbolted from a wall are strewn across the floor of the stockroom of Anchorage True Value Hardware following an earthquake Friday morning, Nov. 30, 2018, in Anchorage, Alaska. Store owner Tim Craig says no one was injured in the store but hundreds of items hit the floor from shelves. He says off-duty staffers as well as customers offered to help clean up. In this image courtesy of Dr. Holly A. 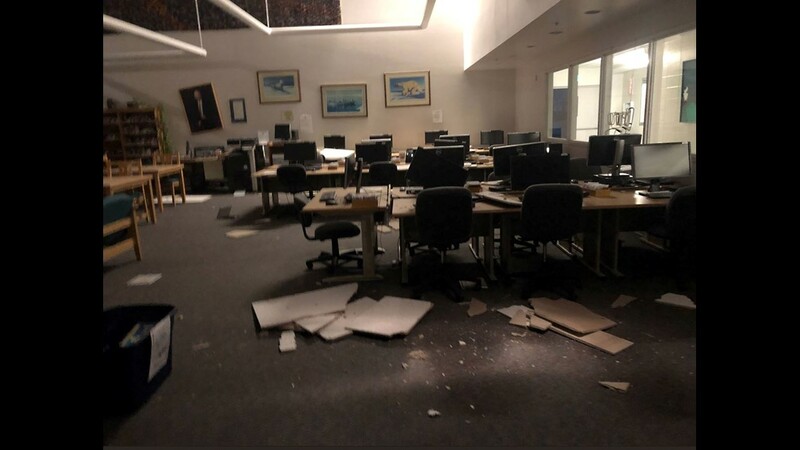 Bell, books and ceiling tiles litter the floor at the The Mat-Su College library in Anchorage, Alaska, on Nov. 30, 2018, after a 7.0 magnitude earthquake. The powerful earthquake caused damage to homes and businesses and triggering a tsunami warning. The earthquake was located about eight miles north of Anchorage and struck at 8:29 am local time, the US Geological Survey said. In this image courtesy of Dr. Holly A. 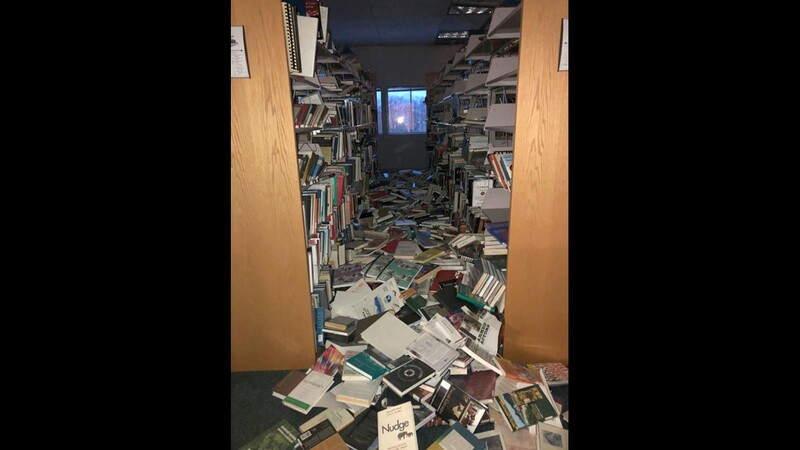 Bell, books and ceiling tiles litter the floor at the The Mat-Su College library in Anchorage, Alaska, on Nov. 30, 2018, after a 7.0 magnitude earthquake. 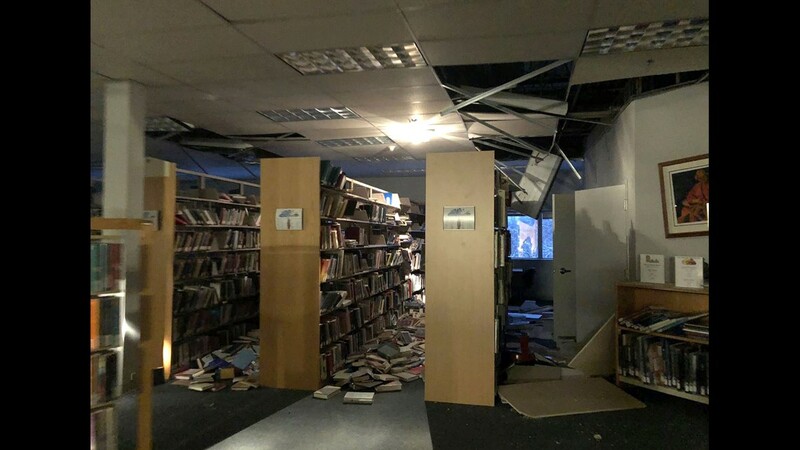 Books and ceiling tiles litter the floor at the The Mat-Su College library in Anchorage, Alaska, on Nov. 30, 2018, after a 7.0 magnitude earthquake. 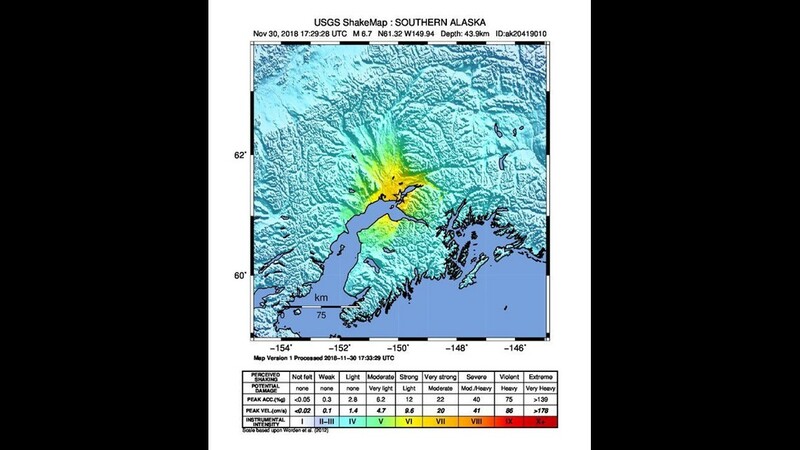 A handout photo made available by the United States Geological Survey of a USGS Shake Map showing the location of the earthquake that has hit about eight miles north of Alaska's largest city of Anchorage, Alaska on Nov. 30, 2018.